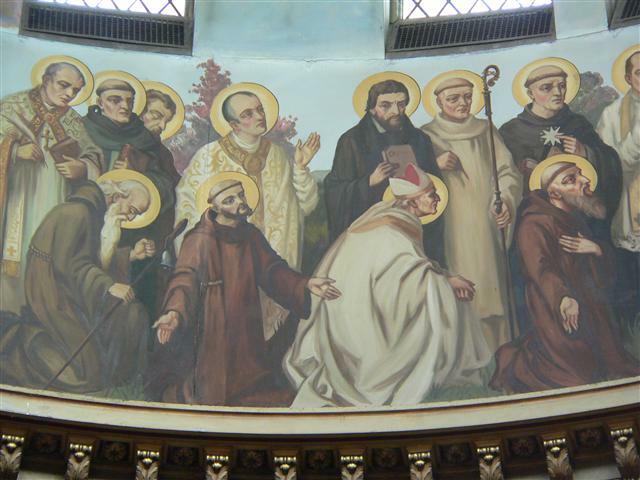 St. Dominic (1170-1221), whose feast day is celebrated on August 8, is depicted in this grouping of monks, hermits and religious in the dome of our church. He is the standing figure, second from the left, shown holding a book. The painting is by Buffalo-born artist Joseph Mazur. Photo credit: Gary Kelley. Thursday, August 8 ~ at 8:00 p.m ~ Bingo will be played in St. Charles Hall. Saturday, August 10 at 8:00 p.m ~ Bingo will be played in St. Charles Hall. Monday, August 5 ~ Dedication of the Basilica of St. Mary Major ~ Communion Service at 11 a.m.
Friday, August 9 ~ Wedding of Nicholas DelBello and Miranda Giangrosso at 3 p.m.
Summer in the City, Sunday August 4, 12 Noon – 4:00 p.m. ~ The Catholic Churches of Central Buffalo continued a tradition begun a number of years ago at St. Gerard’s by coming together for “Summer in the City,” a communal celebration of summer. The event took place at SS. Columba-Brigid. Special thanks to Dan Korchowsky and Amy Johnson who coordinated Blessed Trinity’s participation — and to Angela Jost for bringing her magic bubble wands. 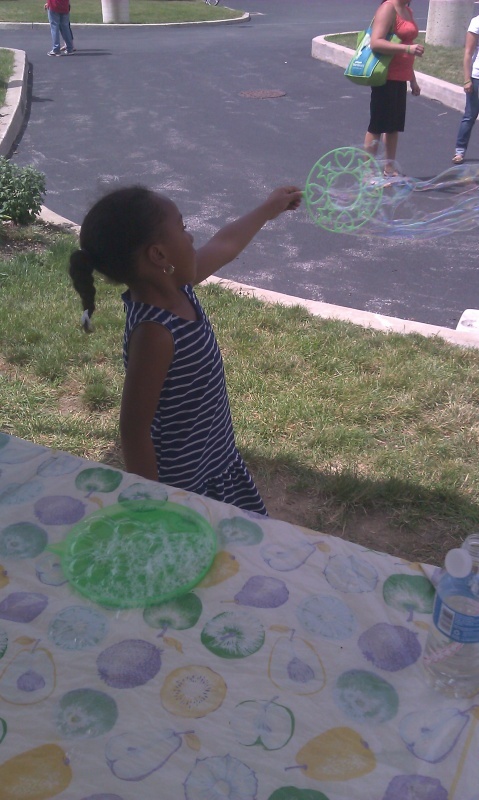 For more photos from Summer in the City, click HERE. Project Homeless Connect ~ As a way of showing homeless people and families that the community is aware of and cares for them, we are collecting deodorants for the Personal Items Bags that they will receive on September 5 at the 5th Annual Project Homeless Connect Day at the Buffalo Niagara Convention Center. Baskets for your donations are at each end of the altar railing and will remain through the weekend of August 3/4. We thank Sister Claire Edwards, Daughter of Charity from Sisters Hospital, and our Parish Council for bringing this worthwhile project to our attention, and we thank you for your generous cooperation!! !Parish Council Elections ~ It’s time for Parish Council elections. There are four vacancies this year. You will find copies of a questionnaire in every pew, asking you to suggest someone in the parish that you feel might be a good candidate. Members of the nominating committee will take your suggestions seriously and contact the individuals you have selected to see if they would consider running for election to a three-year term on our Parish Council. NativityMiguel Student Recognized as a “Man for Others” ~ The 2013 Higher Achievement Program (HAP) at Canisius High School concluded on Wednesday, July 25th with a graduation ceremony in the school auditorium. At the end of ceremony, The Pedro Arrupe Award for Service was presented to NativityMiguel student, Keith Mack, who was recognized as the student who conducted himself as a true “man for others.” The Canisius HAP is for boys who have just completed the 7th grade. Participation of NativityMiguel students in HAP was made possible through the generous support of those of you who donated gift certificates received at fundraisers or made contributions to The POLARIS Fund, our partner organization that provides tuition assistance to our graduates in high school. Each family contributed to the cost, as well. The recognition and achievements of these students would not have happened without you. Thank you for helping these young men on their journey toward success in high school and beyond!